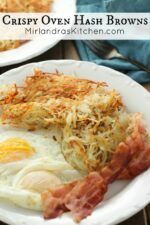 The oven is the easiest way to make perfect, crispy, golden hash browns! They taste amazing, never burn and you don’t have to slave in the kitchen! Raise your hand if you LOVE breakfast! Bacon, eggs, hash browns, pancakes, sausage, coffee, orange juice – am I speaking your language yet? In his quest for amazing breakfast Jonathan has tried a lot of different ways of making hash browns. The problem is he gets easily distracted with his epic cooking projects and we have had more than a few burned batches. I think at this point we have tried cooking hash browns with every method possible! After years of trial and error I’m convinced that oven hash browns are the BEST! You don’t have to stir. The potatoes get tossed in, you set a timer and then breakfast is ready! So how do you like them apples? Yeah…I thought so. Unless you have a house elf hidden somewhere I don’t know about (geeky Harry Potter reference) you need this breakfast recipe! Have a great week guys. Thanks for stopping by to cook with me! Tools In This Post: Hash browns that are shredded in a food processor actually have a better texture for cooking! And it saves a ton of time / getting your fingers on a box grater. This is a good tool to invest in for quite a few cooking projects. If you love breakfast as much as we do try these pancakes. 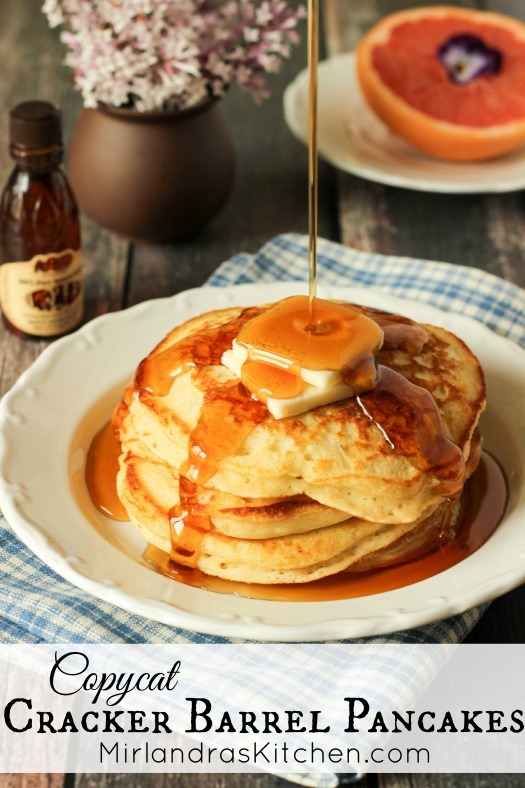 They are amazing and readers tell me all the time this is now their only pancake recipe! The oven is the easiest way to make perfect, crispy, golden hash browns! They taste amazing, never burn and you don't have to slave in the kitchen! Preheat oven to 400 F. Line a sheet pan with parchment paper. Peel potatoes and shred in a food processor with the shredding attachment (preferred) or with a box grater. Put the shredded potatoes in a large bowl and fill with cold water. Swish and then dump the potatoes into a colander. Put the potatoes back into the bowl and repeat twice more. The water will be fairly clear when you are done. One handful at a time, squeeze shredded potatoes as hard as you can to get as much water out as possible before returning them to the bowl. Add the rest of the ingredients and toss by hand until well mixed. Scatter the potatoes over the lined pan as evenly as possible. I love adding spices to the hash browns, also herbs. I am so excited to try this method of cooking hashbrowns. Thank you! She is such a sweet baby and we are loving having her in our family. I hope you like the hash browns. Nothing like great food that is also easy! I love how you don’t have to stir!!! Easy recipes are definitely my favorites! Can’t wait to try this. I think I had more than 5 1/2 c of potatoes because mine were still pale white after 30 minutes. I increased the oven temp to 450 and they were done after an additional 20 minutes. The flavor was good and the hash browns were crispy without being greasy. Thanks for a great recipe! I’m so glad you liked it! If you had extra potatoes it would have taken longer for sure. You also might want to put a thermometer in your oven and just give it a check to make sure it is the right temp. Most grocery stores have a metal one that can just hang in your oven and help you figure out your exact temperatures. I’m surprised how often ovens are wrong! Now I want hash browns – must be snack time! I wanted to try something simple so I tried your recipe . Everything was great until they were done when the parchment paper stuck to the hashbrowns . Next time I’ll do it without the parchment paper . I’m sorry that happened! I’ve not run into that issue but sometimes different people have different experiences. Hope it works great for you next time! This happened to me as well, during a brunch with guests…I would suggest using foil instead if you feel you need to make cleaning easier. Thanks for the suggestion! I’m sorry you had an issue with it. I have been cooking my hashbrowns in the oven for a couple of years now.. never thought to move them to the top rack.. cant wait to try it.. I also like my hashbrowns in bacon grease.. i know its bad but its oooohhhh so good.. you can make your bacon in the oven as well.. preheat at 400 degrees.. line your baking sheet with foil. layering your sheet with bacon and put in oven.. for 15 to 20 min.. afterwards take your bacon out onto a paper towel plate. put your hashbowns on the baking sheet mix it up with your bacon grease.. and put back in your already preheated 400 degree oven for the required time.. I am sure you will enjoy it. Oh you are speaking my language!!!! And – you are in luck! 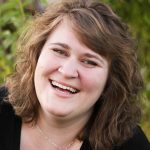 Recent studies are indicating that using animal fat might be a healthy option. So bring on the bacon grease! I can’t wait to try this – my husband is going to be ecstatic! Thanks so much for cluing us into this genius idea! Mirlandra, it’s amazing! I just randomly found your blog looking for this recipe. Awesome! Good for you! Mirlandra, it looks awesome! So much flavors packed on this recipe that makes this simply irresistible, definitely having this on my table! Thanks! 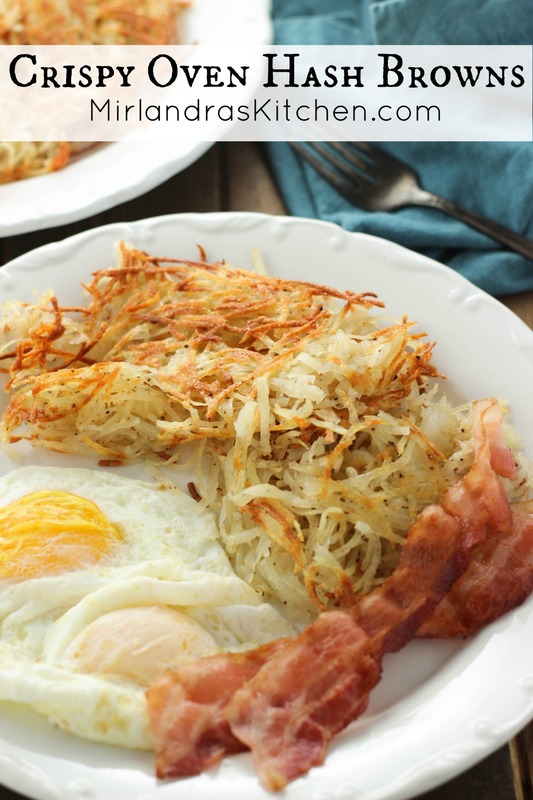 Nothing like a delicious hash browns to add to the breakfast table! Happy cooking! Mirlandra, that recipe looks so yummy! I’ll have to try that one. Thanks for sharing. Glad you like it. Enjoy!